You guys, I had the hardest time getting dressed yesterday. I was simply not in the mood to wear green. 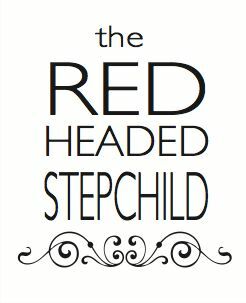 Even someone who actually has Irish heritage (ginger much?) was just not into representing the St. Patty’s spirit with green anything. Instead, I was left wishing that we officially make gold a recognized St. Patrick’s Day celebratory color. Because, you know, still into gold everything these days. Gold just makes even the most boring, functional items a bit more glam. 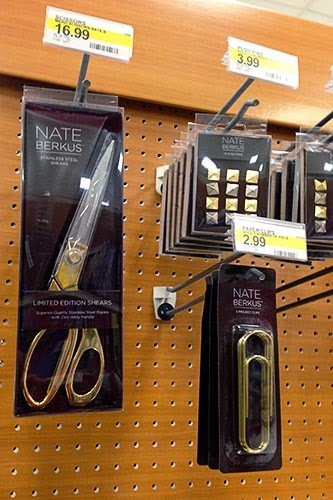 Nate Berkus agrees with me, as I learned the last time I visited the Target office supply aisle. I opted against buying a $17 pair of scissors, but I won’t lie, I totally wanted to. So in the spirit of the underrepresented St. Patty’s color and glamming up my house for spring, I thought I’d show you three ways I recently made something banal into something blingy with a touch of gold... all from the office supply aisle. But no fancy Nate Berkus stuff here! We’re going super simple. 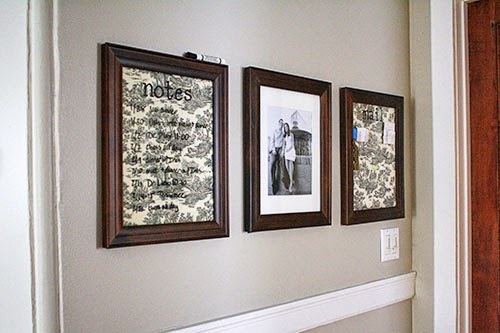 First up: our noteboard by our front door, part of our DIY wall-mounted landing strip. See that dry-erase marker up there? 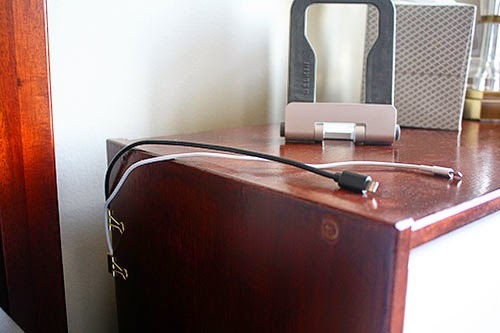 I don’t keep it there solely for functionality, even if that is reason enough. 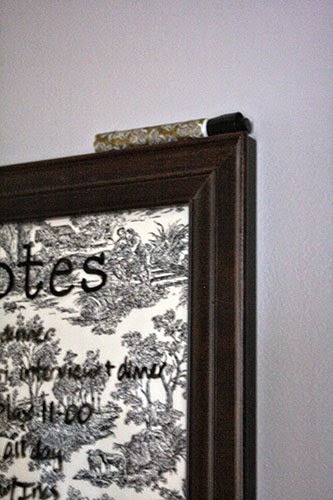 Actually, I store it on top of the “dry erase board” because I bought those frames at Homegoods at a discount. Discount = imperfect, and in this case, the simple hook hanger on the back of that particular frame is off-center. That means it always hangs crooked... unless I add a bit of extra weight on the top right. Secret’s out! Since the marker is up there full-time, I decided to make it a bit more stylish. 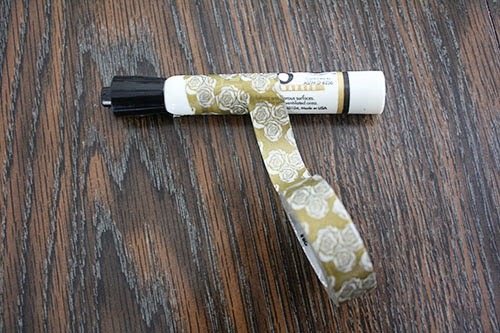 Enter: gold washi tape. A few wraps later and even in the dim foyer lighting, the marker looked more decorative (but functional! ), less high-school-classroom. Yup. 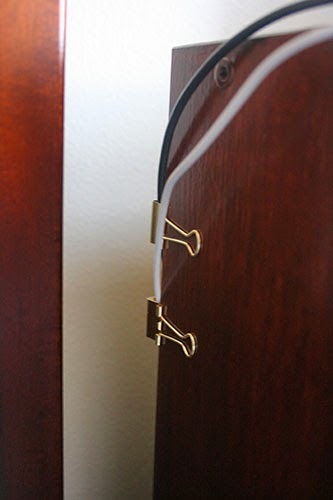 GOLD binder clips. They cost fifty cents more than the basic black/silver, but I’m worth it. His pillow usually blocks the little clips from view anyway, but when you see them, the gold means they don’t scream “binder clips”, which makes me happy. 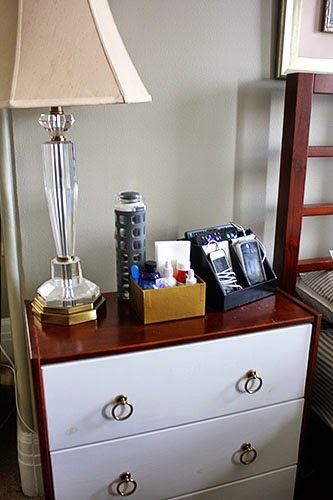 Finally, another nightstand project, thanks to the newest member of our household. With all those night feedings, Baby P and I required a lot of stuff at arm’s reach at 3AM. A LOT of stuff. Which of course would all get knocked onto the floor as I grasped, blindly, for the one thing that had inevitably fallen back behind the nightstand. Again, at 3AM. I needed something to corral all those items, and I found the perfect container – the gold cardboard box that those pink thank-you notes came in. Sturdy, and no logo or stickers anywhere on the sides! Amazing! 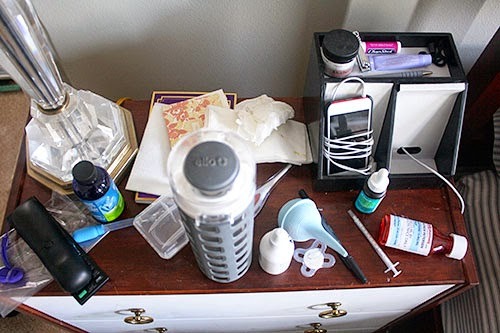 Although this may just look like it helped to make my bedside table a bit neater, this was actually a game changer in terms of locating items in the middle of the night. 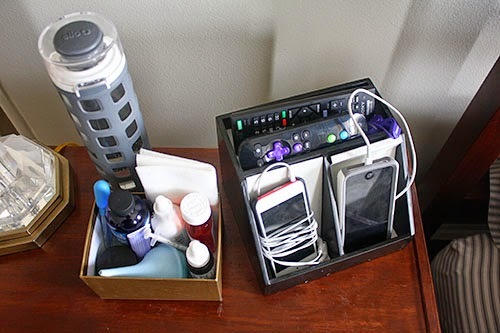 Everything fit perfectly without extra space, so I know exactly where things are just by feeling for them. So there you have it, three small ways I went for functionality in our home while glamming it up with gold! 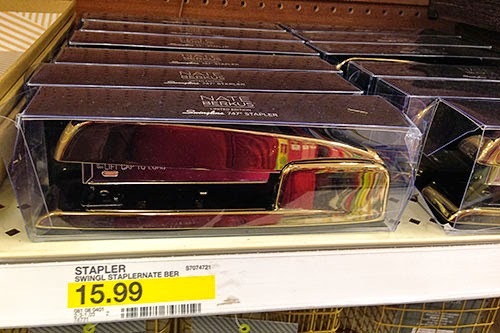 And better yet... gold office supplies. It’s the little things when you’re swamped with work and an infant, you know. Oh and for the record, I just put on a chunky green necklace with my otherwise neutral outfit yesterday... with additional gold jewelry, natch. Happy belated St. Patty’s! Maybe next year we’ll all go for gold instead of green?